If you’ve been following the recent Carrier IQ controversy, you’ll know that there is this one rootkit that comes pre-installed on most Android smartphones in the US that not only logs how many calls were dropped and your location, but also sent and received texts, emails, entire calls, keyboard taps and more without ever asking the user for permission. There are various somewhat complicated ways to detect it, but a rather simple method has cropped today that just involves installing an app from Android Market and launching it. Details of the app-in-question can be checked out after the break. The news comes straight from the official Lookout Blog. We covered an app called Logging Checker by an XDA-Developer. Although the app worked completely fine, it was released in the form of an APK and, well, wasn’t all that easy to use. The app we’re covering in this post, called Carrier IQ Detector, has been developed by renowned security company Lookout and has been released on the Android Market. 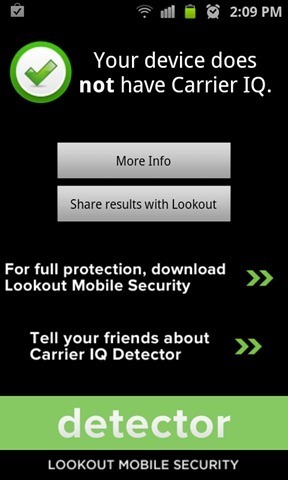 Carrier IQ Detector, as the name suggests, is a very simple app whose sole objective is to detect whether the controversial, privacy-invading Carrier IQ rootkit exists on your Android device or not so you can then take steps to remove it. It can be difficult for non-technical users to determine whether or not their handset is affected [by it]. We’ve developed the Carrier IQ Detector to aid in this process in an effort to keep mobile users fully informed about what their phone is doing. To check if Carrier IQ is installed on your device, you simply launch Carrier IQ Detector and it will let you know if the rootkit in question was detected or not. I’ve tested the app on my Samsung Galaxy S II, rooted on Android 2.3.3 Gingerbread and the test was a negative i.e. my device does not have Carrier IQ. If you’re interested, the app can be downloaded for free from the link embedded below. Be sure to let us know of your device name, carrier and test results in the comments section over on our Facebook page.